Posted by nathan on 29 Dec 2009 | Tagged as: Adoption, my life. Emily and I spent our first night with Raegan in a small hotel just 5 minutes from the hospital. It was an unforgettable experience. Not just the first night as parents, but the HORRID HOTEL! Let me tell you a little bit about our hotel experience. 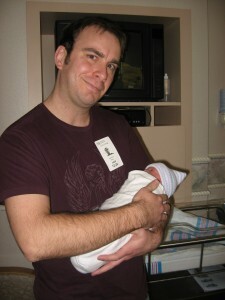 Nathan holding Raegan for the first time, shortly after her birth. We bought the hotel room online, and when we arrived, the hotel told us it wasn’t prepaid. So I argued with her that I was not going to pay again, and she relented and said she would give us the key and she would check with her manager in the morning. So I did, and as I thought, it was indeed prepaid. So that was Saturday night when we arrived. Monday morning we got up, showered and were on the way to the hospital. We arrived back to the hotel with Raegan around 6:30 p.m.
We had no water pressure. I called the front desk, and she didn’t believe me, so she came and checked. Sure enough–would you believe it–we had no water pressure. She called her manager, and he said we just needed to turn the knobs under the sink. Ummm, no, the knobs under the sink don’t control the shower and toilet water pressure, too. So I argued my way into getting a second room for the night, and we were able to stay in the first room, and use the restroom and shower in the second room. That was annoying. This was the worst experience I ever had in a hotel. But, at least I got to share the experience with my daughter! Made it all worth it! Well, what can I say that you don’t already know about a night with a newborn? She slept a lot. She ate and dirtied her diaper every three hours and I didn’t get much sleep. Raegan’s little cry isn’t too loud, but being in a hotel I was concerned about disturbing the neighbors, so I didn’t want to let her cry. She didn’t like to be alone in her bassinet, so every time we’d put her in there, she’d squeak a little and then start to cry. So, I held her most of the night. Luckily I had a Boppy pillow (thanks to Chris & Robyn!) with me so my arms didn’t get tired. I was able to doze off just a bit while holding her. After she eats, she likes to be awake at night for a little bit, so once her diaper was changed, I just held her and let her stare at me and look around to take in her surroundings. It was a precious time. She is a precious girl. Hopefully we’ll get a little more sleep tonight. I’m pretty tired and anxious to get into our new hotel once Raegan has her first doctor’s appointment this afternoon. Our new hotel is supposed to be MUCH nicer. It has a kitchenette with range, microwave and fridge, so we’ll be able to finally get back to eating normal food instead of fast food crap. It had better have running water, too. Oh, man. Praying for you guys! Hopefully you’ll get to come home soon and get settled in at your house. That will make things a lot easier. Hang in there guys! Man, our boppy was LIFESAVER with Brennan! Just think…you’re making memories with Raegan! Years from now, she’ll beg, “Mommy, Daddy, tell me about when I was a baby and that hotel lady was crazy!” We’re thinking of you lots! Well, you two definitely are going to have memories! Soak in all that precious time with Raegan! It goes so fast as they grow. We are so excited for you both! Best of luck in your new hotel room, and Emily- nothing is better then being a new mommy, if you have to go without sleep- a new daughter is the way!!! Cheapskate! Hey, quit complaining and think of all the money you saved! Woo-hoo. What did you expect getting the cheapest hotel in town? Your Mom and I learned those lessons the same way. I hope you spent a little more on the new place because I want you taking good care of my granddaughter. Chris & I have experienced a bed & breakfast with a stopped up toilet (we got an upgrade), to spoiled milk at breakfast. You are making memories that will last a lifetime and we pray that you will have many more (good) memories from this trip of a lifetime. You are in our prayers and we are so excited for you! I never looked forward to being woke up by a crying baby, but once I was up and holding, rocking, feeding one of the boys, it was pure bliss. Enjoy every minute. So happy for the two of you. She is wonderful! I am so thrilled for you!! Emily, isn’t it wonderful to gaze into your baby’s eyes and know that everything she is seeing, she is seeing for the first time?! She is learning that you are her mommy, learning the sound of your voice and your tender touch. What wonderful memories you are making. Soak it up. These days fly by so fast. Remember that “baby” smell. The little rumpled skin. That newborn look fades all too quickly. It’s so bizarre how in one moment, your life is changed forever. I’ll pray for a more restful night for you tonight! :o) There are so many back here in Indiana rejoicing with you and waiting to meet your precious new Raegan! Praise Him, praise Him, He is worthy to be praised. We are sharing in your great joy. What a beauty. Your hearts are now captive and you’ve lost some sleep, but you ain’t seen nothin’ yet. PS. About the “hotel” ; sounds like about half my travel over the years. Hurry back, cause there’s no place like home. This web site is wonderful! Keep the pictures coming! We stayed in a hotel once, that the towels were stiff as a board. I figured they hung them to dry, or might they have been the old towels from the previous occupant? Bad thought! Hope you all sleep better tonight! Love you all!! Congratulations on the new addition to the family Nathan and Emily!! She is very sweet! Welcome to the family Raegan!! You’ve got lots of people who love you!!! Have a safe jouney home!! We are so thrilled for you guys. God never closes a door that He doesn’t open a window. 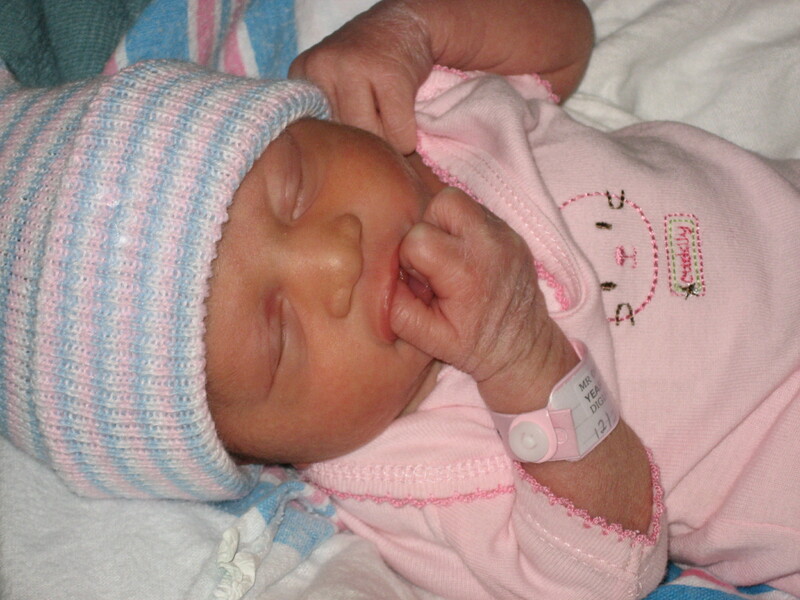 Reagan is so beautiful, we can’t wait to see her in person. An old saying “you get what you pay for”:)!! Cheap hotels are the worst. But think of the memories; these first nights with Reagan will be ones that you’ll never forget. Have a safe journey home, we are praying for you. 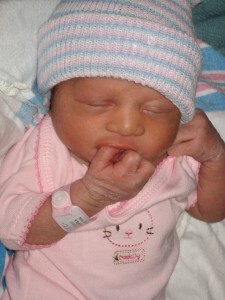 That picture of her sucking her little tiny fingers is the sweetest thing ever!!!! How beautiful is she??!!!! Every little thing that happens to you is gonna be worth it. Happy for you guys, praying everything is easy breezy and you’re back home in Indiana soon so we can all love on her!!! !